I just read Teal's post about things she may order from catalogs and realized I had this photo I've been meaning to post. 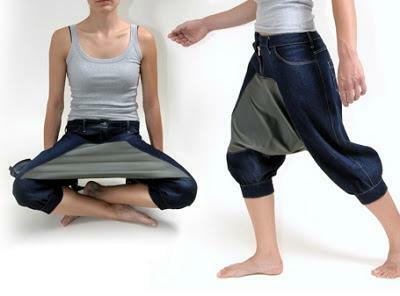 These are called "Picnic Pants"
I suspect the designer of these things must have flunked Design 101. They are godawful ugly and seem to encourage the wearer to "take a dump" without going to the loo. I don't think that would work - the panel is a shelf, not a pocket. Ugly is right!